Summer is sadly over but you're not ready to let it go even though it is the first week of school. You were trying to start the school year off right...but...you got caught breaking the rules! Sent straight to detention after school meant missing the afternoon with your friends at the beach for the last time until next summer break. Will you be able to collect the items you need for the beach and pull an epic prank to get out of detention early so you can enjoy one last day of summer with your friends? All of this must happen in 60 minutes before the teacher returns and catches you! 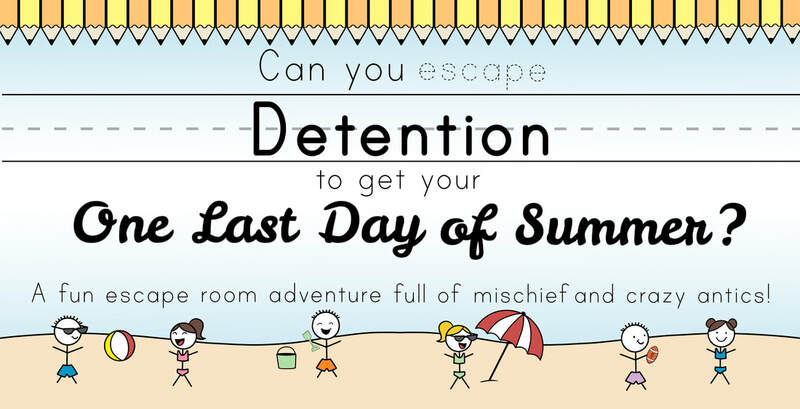 If that happens, forget your afternoon at the beach and say hello to detention for the rest of the year! You finally had a week off from work and you were planning the vacation of a lifetime! Since you were a kid you had always dreamed of traveling through time to explore other eras and the ways of life of people in the past and in the future. Now, the first ever time machine is up and running and bookings are available to the public for vacation getaways. Since the opportunity presented itself, you were one of the first to eagerly sign up! With the paperwork in hand, the front page reads, "To all time travelers - WARNING: TIME MACHINE STILL BEING TESTED!!! There is a chance that something goes wrong during your vacation to the past or the future. If so, you will only have 60 minutes to make things right to get back to present times or you will be stuck in your time travel destination." Even with the warning, you proceeded with the registration. Will you have the vacation of a lifetime or will you be stuck in a different time? Visiting the area? 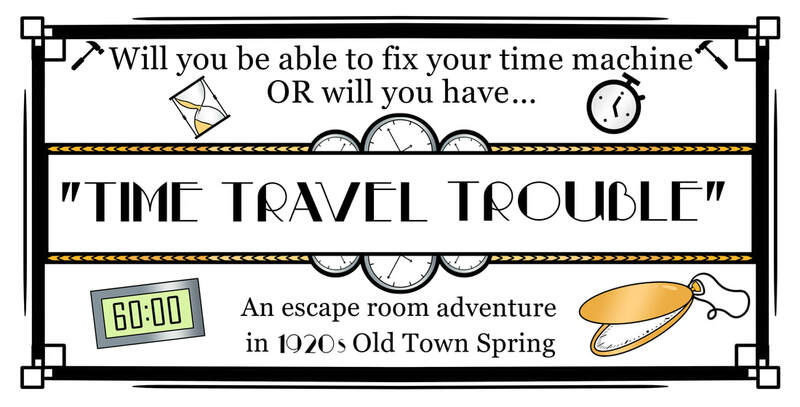 Check out our Time Travel Trouble adventure! The story uses pieces of history from Old Town Spring! This Christmas you've been placed on Santa's naughty list and it's not looking good for you as for what you'll wake up to under the tree! Unless...you can make a deal with one of Santa's head elves to get yourself off the naughty list and on to the nice list. Santa's head elves know just how Santa likes the homes he visits to look. They say if you can create the perfect end to the night in 40 minutes for Santa to arrive to from lots of deliveries, he might just stop by on his way back to the North Pole! Each adventure is $25 per ticket ($21 for "A Christmas Scramble: Naughty or Nice" and "A Haunted Disappearance"). To purchase a ticket for an adventure for a particular time slot, select "Buy Tickets." You may also purchase a Private Adventure which guarantees your group is the only group in the adventure at the particular time you select. To do so, select "Book Private Adventure." (You don't necessarily need to have the same number of people as tickets required for purchasing a private adventure.) 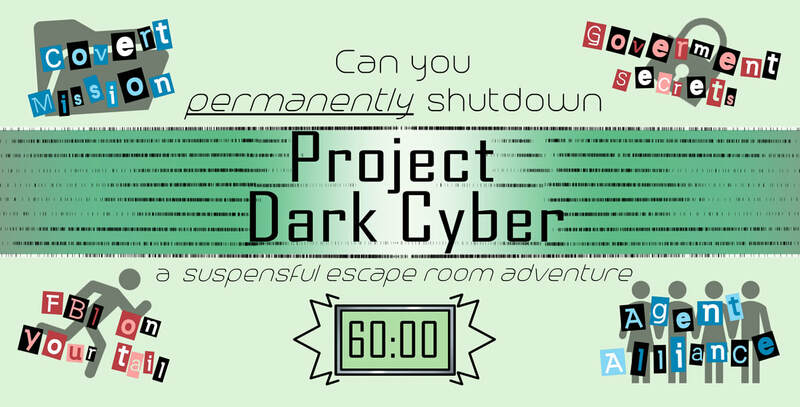 For Project Dark Cyber Expert Mode, you must book a private adventure. If you are looking to replay one of our adventures, please call to book. The adventures are 60 minutes (40 minutes for "A Christmas Scramble: Naughty or Nice" and "A Haunted Disappearance"). The entire experience is about one hour and fifteen minutes which includes an introduction, the 60 minutes to try to escape, a debrief at the end, and a themed picture in front of our green screen (check out the Photos page!). Every group will also have a dedicated Game Master to help you along the way (what's a Game Master? check out the How it Works & FAQs page! ).